Another short post today. I just wanna pop in, show you some corny Halloween-themed cake, and pop right back out so I can get to my nightly dose of homework / studying / self-loathing / whatever happens to come up. One more slice of cake? A handful of prematurely-obtained Halloween candy? Who knows? This cake was inspired by Cookie Dough and Oven Mitt’s similar cake, a dark chocolate affair with a cute spiderweb topping and an even cuter spider. 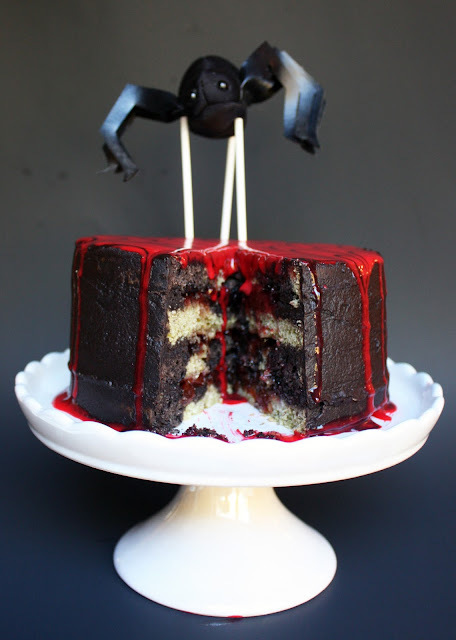 I happen to have a tiny stuffed spider, so I ended up haphazardly propping it up on top of the cake to drive home how incredibly and blood-curdlingly (that’s a word, goddamit) spooky this cake is. A downright inspired addition, I think. I'm not sure this could get any scarier. My original plan was to make a matcha-chocolate cake with spooky matcha marble cake and matcha ganache and everything, but then I very helpfully ran out of matcha—I only had a tablespoon left for the cake, not to mention the ganache! You can picture me sinking to the kitchen floor, fists clenched, tears streaming out of my eyes as I cried heavenward, “WHY MUST THINGS BE THIS WAY?! ?” upon realizing this. But nevertheless, I trudged forward in my Halloween baking journey and just used a measly tablespoon in the cake, sacrificing some of the vibrant green color. I imagine if you use a full 2 or 3 tablespoons, you’ll get a much greener cake. Also, because I was now lacking matcha, I was forced to use some other form of coloring for the ganache. I ended up using red food coloring, very reluctantly, because you probably know how much I hate using it. But what’s done is done, and as you can see the red color is very...vibrant, if not perfectly blood-like. It was a little runny, though, as you can see. Maybe don’t use as much milk as I did. Lesson learned. And of course there is the cherry jam filling (blood and guts, anyone?) and the deep-dark-chocolate frosting (using that “special dark” cocoa powder stuff). There are a lot of components in here, but they taste pretty good together, since it’s just chocolate (in its various forms), cherry, and matcha. Pretty tasty combination of elements if I do say so myself. First, make cake. Preheat oven to 350 degrees F. Grease two 6-inch round baking pans and line the bottoms with parchment. In a small bowl, combine flaxseed and water. Let stand until thickened. Also whisk together flour, baking powder, and salt in a separate bowl. Combine vegan butter and sugar in the bowl of an electric stand mixer. Cream until light and fluffy, about 2 minutes. Add flaxseed mixture and beat to combine. Add vanilla and mix once more. Combine milk and yogurt in a measuring cup. Add flour mixture and milk mixture in alternating additions, beginning and ending with flour mixture. Do not over-mix. Place half your batter in a separate bowl. Stir matcha powder into one half of the batter and cocoa powder into the other half. Plop alternating dollops of batter in each baking pan. Swirl to make a nice marble pattern. Bake cakes for 30 minutes, until a toothpick inserted comes out clean. Let cool in pans for 10 minutes before transferring to a wire rack to cool completely. Make the chocolate frosting. Combine vegan butter and cocoa powder in the bowl of an electric stand mixer until smooth. Add powdered sugar and beat until incorporated. Add milk and vanilla extract and beat on medium-high until light and fluffy. Make the white chocolate ganache. Place white chocolate in a medium bowl and set aside. Combine milk, vegan butter, and corn syrup in a small saucepan and heat until steaming and hot, but not boiling. Pour mixture over chocolate and let sit for a minute. Whisk for a couple minutes until smooth. Add red food coloring to get your desired color. To make the chocolate glaze, simply whisk together all ingredients in a small bowl until smooth. 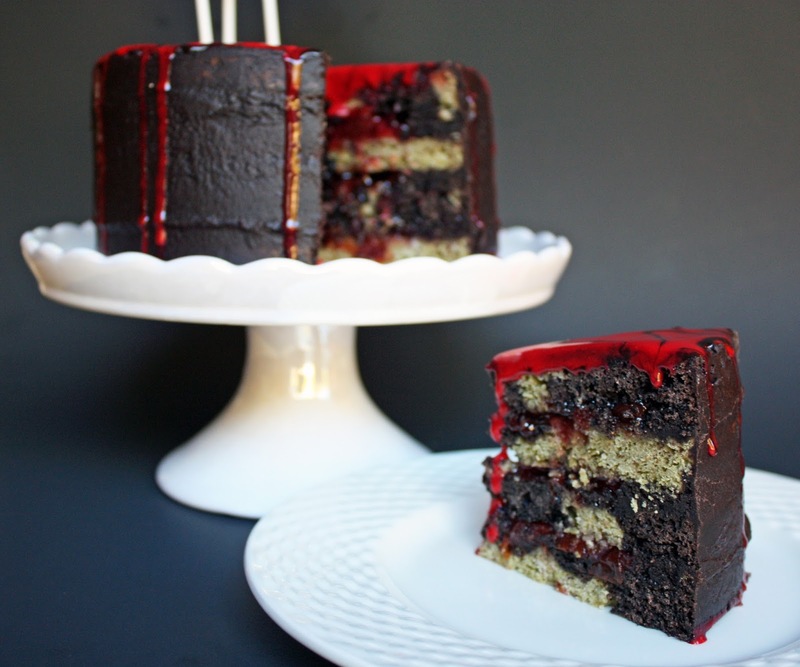 To assemble cake, start by leveling off cake layers with a serrated knife. Cut each layer lengthwise so you have 4 thinner layers. Pipe a ring of chocolate frosting around the edge of one layer and fill with cherry preserves; top with another cake layer. Repeat until you have a 4-layer cake. Frost the entire cake with chocolate frosting. Drizzle white chocolate ganache on top. For the spiderweb pattern, simply pipe thin rings of chocolate glaze in the ganache, then drag a toothpick through the rings, starting from the center. 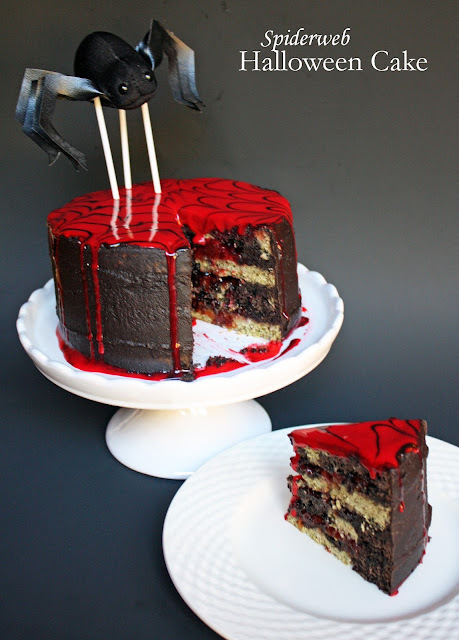 Decorate cake with an adorable stuffed spider, if you have one. The runny ganache was killing me. For more potentially Halloween-themed treats, check out the following links. Creamy red velvet white hot chocolate. 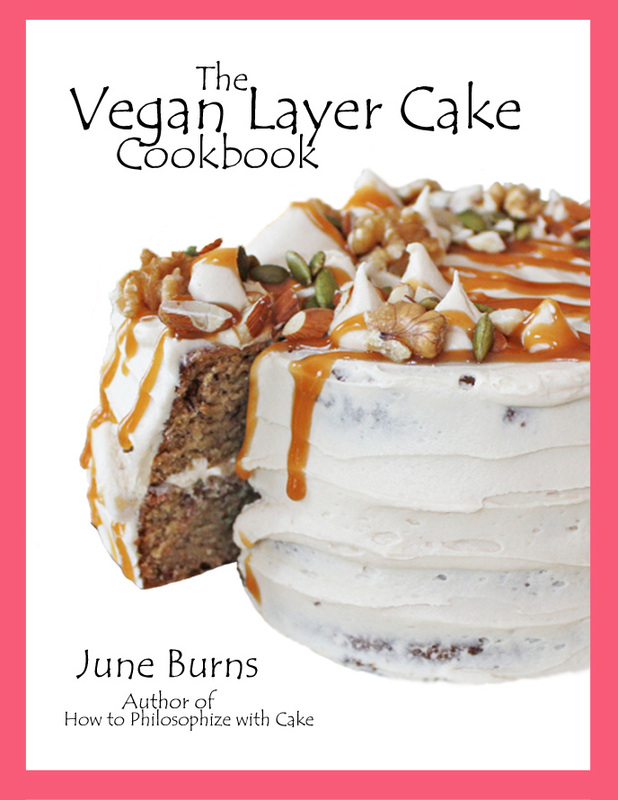 Now that I know how to make vegan white chocolate, this will be a no-brainer! Pumpkin pie cheesecake-stuffed breakfast braid. 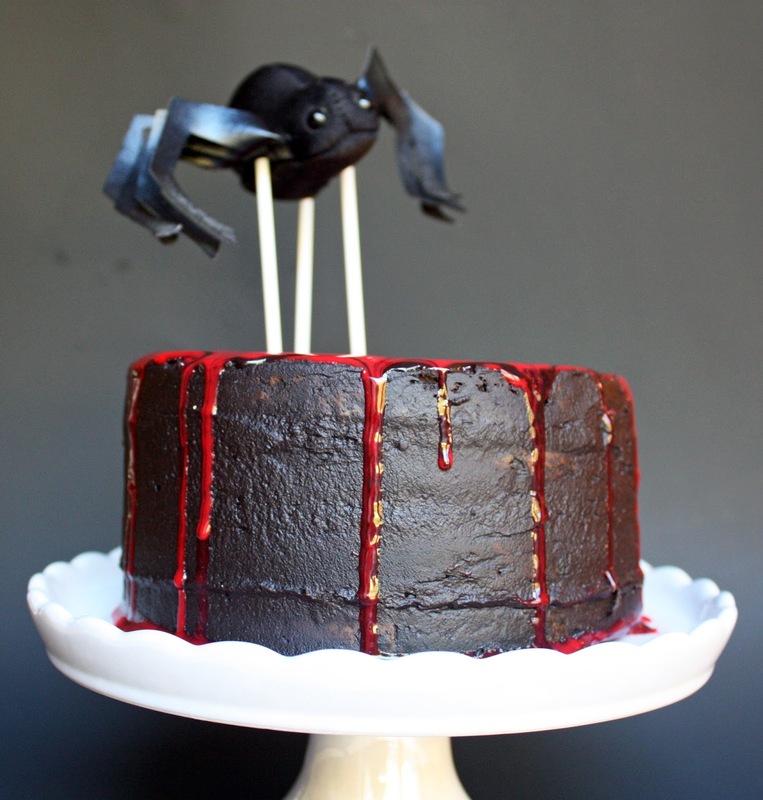 Halloween breakfast, anyone? Brownie brittle. An alternative to store-bought candy. Homemade vegan white chocolate. For making your own vegan candies. 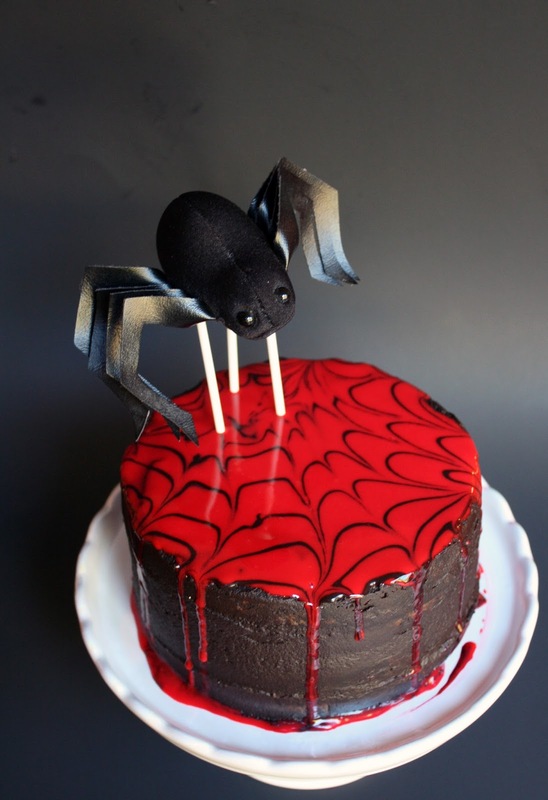 Dear June, what a gorgeous cake indeed - perfect for Halloween. I love the idea of adding cherry jam here and all that chocolate and matcha and the beautiful spiderweb and the cute spider - just amazing. My kids would love for me to bake a cake like this one!